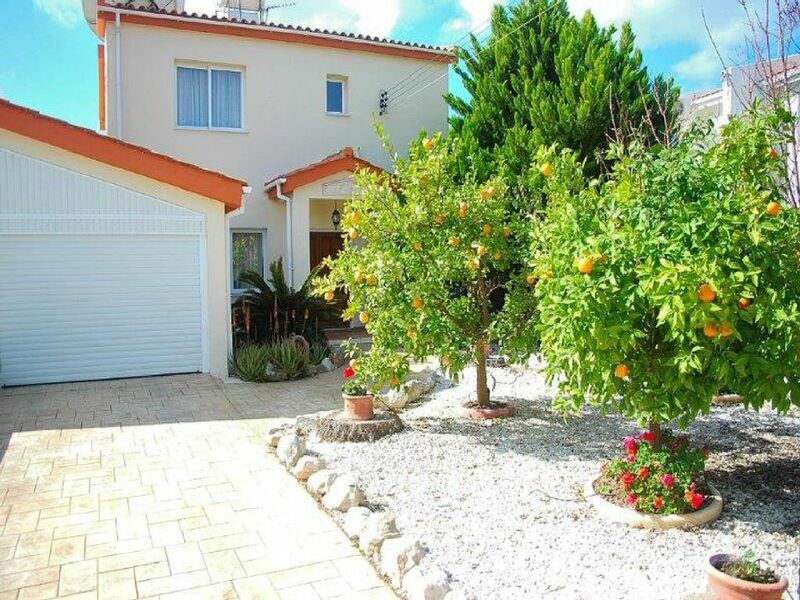 The detached HK villa in Paphos, named villa Hieros Kepos, is in the small village of Koloni, Yeroskipou, a beautiful part of Paphos, offering the tourist quiet and relaxed tranquil surroundings but having all the local atmosphere and local culture thrown in. The detached, 3 bed all ensuite villa is ideally situated being only a short casual walk into the next village of Yeroskipou where you can get the local bus services to the seafront and many tourist attractions around the Paphos district. Various shops including, the local supermarket, bakers, banks, post office, and taverns. On the first floor, the accommodation is in 3 large double bedrooms, all having queen sized beds and are fully en-suite with bath or shower. All 3 bedrooms are tastefully decorated and furnished, with hair dryers, bedside tables and table lamps, sleeping up to 6 persons. The villa has full air-conditioning and heating units to all the villa rooms. Two bedrooms lead onto the upper sun balcony having great sea and sunset views. On the ground floor is the comfortable open plan lounge and dining areas with panoramic sea views through the two patio floor to ceiling doorways. A 55" hdmi TV with all UK BBC/ITV, Films, Discovery and Sky sports channels, a DVD player, a good selection of books, games, music and films. The villa offers FREE internet and WiFi access plus a notebook usage on request. Two mountain bikes are also available upon request. Front driveway leading to the villa front door has room for two cars and there is extra roadside parking available for at least two more cars. The HK villa Paphos is surrounded by gardens / patio`s with fruit trees to the gardens front and side section of the villa. At the rear of the villa is the private 8m x 4m swimming pool, gas heated if required during the months November to March, A deluxe spa hot tub, Sunbeds and loungers with parasols for you to relax enjoying the long days in the Cyprus sunshine, all having great sea views. We have a deluxe mobile gas six burner with oven hood BBQ, plus the traditional Cypriot charcoal burner BBQ, called a souvla are provided along with a breakfast table and chairs with parasol, plus a patio dining table and chairs with parasol for those pleasant sunny evenings when only eating outside the villa in fresco style will complete that perfect day. On the shaded terrace there is a exercise bike for the the holidaymaker wishing to stay fit, also a swing hammock to enjoy the sea views and watch the end of the day come to a close with fantastic sunsets we see over Paphos. Hello, We are John and Ann, a retired couple originally from the UK now living in Paphos, Cyprus. We were successful owners / self-employed hoteliers for over 29 years in the popular holiday resort and fishing village of Whitby in North Yorkshire, UK. and therefore feel we know the hospitality business requirements of our customers expectations. We always endeavor and strive to attain very high standards and services throughout our villa, providing that customer expectation in making your holiday a relaxing, pleasant and memorable one as possible. In the year 2002, we decided that Paphos was the place we would like to build to our detached villa, to our own specifications, being a 3 bedroom holiday villa with full en-suite facilities and offering great sea views. We had a private gas heated swimming pool installed and separate deluxe spa hot tub. The villa was completed in March 2004. South facing, the HK villa in Paphos has great sea views over the countryside, with country lanes that lead down to the local Rikko`s beach. From the villa you can enjoy spectacular panoramic sunsets ending the day over Paphos. The quiet location of our villa is away from the hustle and bustle of the tourist resorts of apartments, hotels and situated in the small village of Koloni, Yeroskipou, Paphos. Just a short walk from the villa is the supermarket, a bakers selling fresh bread / cakes and a further short walk takes you into the larger village of Yeroskipou. Here you will find where the Turkish/Cypriot delight is made, the historic 5 domed church in a magnificent village square, taverns, banks, post office, various local shops selling local produce. Why not sit here a while in our tranquil village square with its fountains to sit, taking in a coffee and local cake. Should you wish to visit Paphos seafront, Paphos harbour Mosaics, Restaurants, Bars and Cafe`s, you can catch either the local bus outside the supermarket or take a scenic 5 minute drive in your rented car. A short drive will take you to other coastal resorts of Coral Bay, Polis, Latchi, Pissouri, making the villa Hieros Kepos an ideal location for your holiday. We love the location and area of our HK villa in Paphos, villa Hieros Kepos, for many reasons, one being it is South facing getting sunshine all day long with the superb sea and sunset views. The village location is very restful and private with inspiring views over the sea and surrounding countryside, yet within easy access to all the tourist area`s. When staying at the HK villa Paphos, villa Hieros Kepos, you can put on your summer holiday attire of shorts and lightweight shirt, blouse first thing in the morning, have your breakfast on the sunshine terrace, check your emails using the free wifi, then be in the private heated 8m x 4m swimming pool having your first dip of the day. Then relax enjoying the fantastic panoramic views to the sea, use the swing hammock reading your book of the day or just take in the sunshine on the sunbeds. What a great way to spend your day. In the evenings, fire up the large gas BBQ with its hood oven or use the more popular local charcoal BBQ and enjoy alfresco fresh Cypriot foods for dining with a glass or two of local wines. Now the stars are out in the blackened sky, take a spa hot tub dip with your local tipple and relax those muscles before retiring for the day into the villas comfortable large double bedrooms. Tomorrow you might wish to venture further afield and see some of the historic sites that Cyprus offers in and around Paphos region, or maybe just relax again around the villa and its swimming pool. The choice is always yours. Master Bedroom 1 Has a bath with overhead shower and shower screen. Toilet and wash hand basin. Bedrooms 2 & 3 All have shower cubicles, not shower curtains plus toilet and wash hand basins. Downstairs there is a visitors cloakroom toilet and hand wash basin. Safe bathing with a mix of sand and pebble, the nearest beach is named Yaroskipou beach but locally known as Rikko`s beach. Distance is around 3.5k from the villa. Distance to nearest beach is around 3.5k from the villa Hieros Kepos. Yeroskipou village is a short stroll from the villa, with its remarkable five-domed Byzantine church of Agia Paraskevi, and its Folk Art Museum, is a popular tourist destination. It can be a bit busy but it represents a nice stroll along the waterfront with a view of the marina, harbour and the castle. A few shops and covered market, nice for browsing. Villa Hieros Kepos is South facing having panoramic sea views over the coastal countryside to the sea with sunshine all day long and fantastic sun sets. Mobile available on request. You buy a local sim card that will cost around 25 euros BUT you get very low cost for any overseas calls you make. All beds have top and bottom sheet of cotton linen. Summer throws or Winter blankets are available. Bedroom hand and bath towels are provided. Changeovers are carried out weekly. Bosch 6kg load with 1200 spin. Never need here in Paphos as clothes generally dry with two hours of the Cyprus sunshine and the sea breezes we experience. Ample parking. Two cars on the driveway and two on the villas cul de sac road frontage. Hand and bath bedroom towels are provided. Sunbed towels are also provided for each guest. Open plan lounge seating up to nine persons having two large floor to ceiling patio doors offering pool area and great sea views. Ample storage for a family of 6. The hob top has 3 gas rings and 1 electric. Various machines to make your style of coffee. Including a Cypriot/Turkish coffee pot. Villa provides a full compliment of kitchenware, dishes, cutlery for at least six persons, plus various cooking utensil pots and pans are all provided. If we dont have it, tell us and we will buy it..
We have the interior dining table and chairs for six persons close to the kitchen serving hatch. Externally the villa has outside dining tables, parasols and chairs for at least six persons. FREE WiFi internet and satellite services which include UK tv channels provided via the latest control box. Notebook laptop available on request. With a wide selection of films and music is provided. Book Swap service in operation on all books. Many to choose from. Various board and card games. Games table provided. A good selction to choose from. Many DVD films to choose from. Variety of fruit trees to the front and side gardens of the villa. Privacy provided via high side hedges and a lower rear hedge. Find many activities on Paphos seafront, including operators providing various types of boats for hire. Two mountain bikes available upon request. NOTE: There is assumption of risk, waiver and release agreement form required to be signed to use these free bikes. Small private boat hire, Sea fishing trips, Dinner functions are bookable from Paphos harbour seafront. Also bookable are coastal trips, with the evening dinner functions ending with firework display. Shaded area with swing hammock and basic exercise cycle workout machine. Paphos seafront and local beaches offers various operations for sporting activities. Fishing trips, Sight seeing coastal water trips, Hang gliding, Hiring small inshore boats are just a few services. Troodos mountains provide excellent winter skiing and snow boarding facilities throught the months of December - early March. The Troodos also offers some fantastic panaromic summer walks. The Troodos mountain region is approximately fifty minutes scenic drive through local villages from the villa Hieros Kepos. Just a short drive to local tennis courts and general sports clubs. SORRY. All bedrooms are on the upper second floor and not accessible by wheelchair. Gas heating to the pool advised during the months of November through to March with a daily charge for gas usage. Guest must request this service in advance of arrival. Top of the range Canadian Arctic Spa hot tub available all year round. the villa is excellent , john & ann made the holiday great by answering any questions we had about the villa and paphos itself . if we go back to paphos again we would definitely come back here . Look no Further. This Villa is Magic. The title I placed says it all. We have had a wonderful twelve days at the Villa Hieros Kepos in a small village called Koloni which is very close to Geroskipou and only a five minutes drive into Paphos front where you find all the tourist places with cafe`s, bars, restaurants, hotels, not for us though. Ann and John were so helpful and offered us a warm, friendly welcome to their villa in Paphos. They showed us around the villa and explained where everything was and answered our questions. The bedrooms have there own bathrooms with balcony. The beds were very comfortable. The lounge and dining area`s were spacious, lovely and clean. John arranged for our requested car hire and the free transfers went smoothly. It was a great holiday. I can't fault the Villa Hieros Kepos in anyway at all and hope to return again next year. Darren. Doncaster. Yorkshire. England. Thank you for your review on your stay at the villa Hieros Kepos. It is much appreciated you put pen to paper, or finger to the keyboard. LOL. Ann and I are so pleased you enjoyed your stay and we both look forward to seeing you all again soon. HK Villa Paphos: The villa Hieros Kepos is situated in a small quiet village close to the village of Yeroskipou, Paphos. The local Yeroskipou beach, also known as Rikkos beach, is on Paphos seafront and is approximately 4 minutes drive or a gentle 50 minutes walk from the villa Hieros Kepos, through the lanes of orange and lemon groves, leading to the sea front and beaches. Paphos seafront, fort castle, harbour and tourist resort is approximately 6 minutes drive from the villa with Coral Bay resort just 15 minutes drive away. Paphos International airport is approximately 12k, a 12 minutes drive from the villa. Larnaca International airport is approximately 100k, a 50 / 60 minutes drive from the villa. Car hire is recommended and can be arranged for you to include free airport transfers. Taxi services for airport transfers and Island tours can be arranged using well known taxi service. The nearest sea port is in Limassol, some 30 minutes drive from the villa. Yeroskipou village with its historic five domed church is 3 minute drive, 20 minute casual walk from the villa. Paphos seafront, the Roman villa mosaics, fishing harbour, castle and Tombs of the Kings are 10 minutes drive from the villa. Coral Bay resort is 15 minutes drive from the villa. The National park of Akamas peninsula where you find breeding turtles and Cyprus wild life is approximately 25 minutes drive from the villa. Polis resort is a 40 minute drive through beautiful countryside. The detached HK villa Paphos is ideally situated in a small quiet village close to Yeroskipou village in the Paphos region. Amenities include a local supermarket, on the premises bakers for fresh breads and local cakes, a post office, banks, various bars and tavernas, all within walking distance of the villa Hieros Kepos. We do recommend hiring a car though to visit many historic places of interest on the Island of Cyprus. Polis village is 10 miles Nortth of Paphos and still a relatively unspoilt part of Paphos with its local tavernas and shops. It still retains a more relaxed way of life even today. Latchi, the other main town in this area of Polis. Again there are a few shops here for tourists, and a number of traditional tavernas and restaurants, all of which are next to the beach and boat quay. For those looking for water sports Latchi has a water sports centre, where you can hire a boat or even go diving. Petra Tou Romiou (Birthplace of Aphrodite) - 20 km east of Paphos. According to legend, Aphrodite, goddess of love and beauty, rose from the waves in this strikingly beautiful spot. The Greek name, Petra tou Romiou (The Rock of the Greek), is associated with the legendary frontier-guard of Byzantine times, Dighenis Akritas, who kept the marauding Saracens at bay with amazing strength. It is said in one such fight he heaved a large rock (Petra) at his enemy. Yeroskipou Folk Art Museum. The name of the village comes from the Greek word "Hieroskipos", the sacred Garden of Aphrodite. A fascinating collection of Cyprus folk arts and crafts is gathered together in the house known as Hadjismith. Yeroskipou village has the Ayia Paraskevi Church, 3 km east of Paphos. One of the most interesting and attractive Byzantine churches on the island, dating to the 10th century, with a vaulted basilica, a nave and two aisles surmounted by five domes, with later frescoes dating to the 15th century. Kouklia village is the Temple Of Aphrodite, 14 km east of Paphos. This is Palaepaphos, Old Paphos, one of the most celebrated places of pilgrimage of the ancient Greek world and once an ancient city kingdom of Cyprus. Here you will find the ruins of the famous Temple of Aphrodite. The most ancient remains date back to the 12th century B.C. The temple was one of the most important places of cult and pilgrimage of the ancient world until the 3rd-4th century A.D. The museum in the Lusignan Manor is small but impressive with many finds from the area. Ayios Neophytos Monastery – Located 9 km north of Paphos. It was founded in around 1200 by the Cypriot hermit and writer Neophytos. The Encleistra or enclosure carved out of the mountain by the hermit contains some of the finest Byzantine frescoes dating from the 12th to 15th century. In the monastery's church there is an interesting collection of icons and remains of 16th century frescoes. Chrysoroyiatissa Monastery – Located 40 km north-east of Paphos. Turn right before Stroumbi village and you will find the monastry set in beautiful surroundings. It is dedicated to Our Lady of the Golden Pomegranate and was originally founded in the 12th century but the present building dates to 1770. An impressive religious ceremony and celebrations are held on 15th August.